The fastest, most precise, and most effortless priming tool. The CPS was designed to address the need for a robust and precise high-volume primer seating tool. The limitations of other priming tools are self-evident to those that have used them for a 300, 500, or 1000rnd priming session. Hand priming tools can cause extreme fatigue in your thumbs and hands. This is especially true when you have a batch of brass with tight primer pockets. The bench-mounted units are often quite a lot safer, but generally much slower. They also often lack the same "feel" you get with the hand priming tools. Recognizing these deficiencies, we set out to design the worlds best priming tool, with all of the strengths of other units, but none of their weaknesses. Good for right-handed or left-handed use. The handle on the CPS can be moved to accommodate any bench position or priming style you prefer. Speed, without sacrificing precision or reliability. Some priming tools are very fast. Others are very precise. The CPS is the only priming tool to combine both features into a single unit. You can achieve seating depths accurate to within a thousandth of an inch, all while priming at a comfortable rate of over 20 cases per minute. At that pace you can easily prime over a thousand cases per hour. Absolute precision primer seating depths. Precision rifle shooters know that one of the keys to reducing your extreme velocity spread is to ensure consistent powder ignition. The CPS has a revolutionary adjustable shell holder system which allows you to raise and lower your case in relation to the priming rod. You can seat the primer deeper or shallower in .001" increments. The adjustment mechanism has tactile and audible clicks to ensure you stay on your desired seating depth. 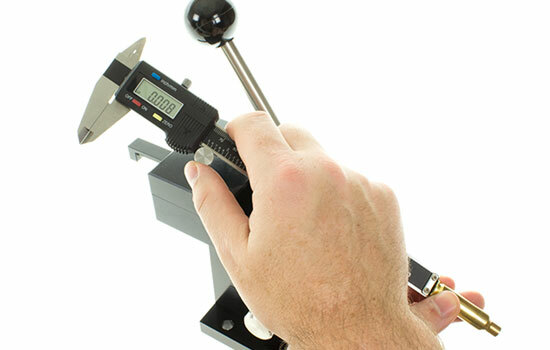 One click = One thousandth of an inch adjustment. Universal primer tube loaded. You can use nearly any brand of primer tube for simple and effective loading of primers into the tool. No more plastic trays to break or fumble with. 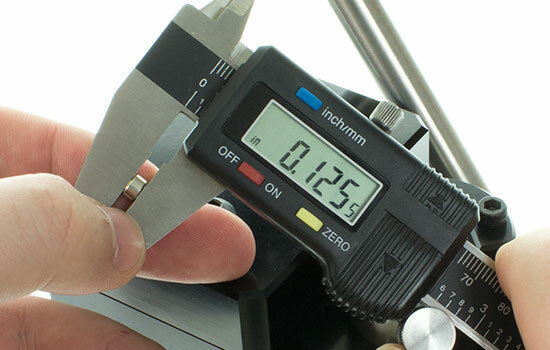 As long as the tubes have an outside diameter of .312" or so, you can use them with the CPS. The unit ships with both small rifle and large rifle priming tubes. Integrated shuttle feeding system. The CPS uses a manually-operated shuttle system to slide primers from the primer tube into position over the primer rod. This ensures that any jams or misaligned primers are easily and safely discovered by the operator. Slight finger pressure is all that is required to position a primer for seating. Sliding the shuttle rearward until it stops will capture a primer from the primer tube. Sliding the shuttle forward will position the primer over the priming rod. This is an effortless motion which completely isolates the primer being pressed into the case from the rest of the primers in the primer tube. The manual operation also ensures that you will be able to feel any malfunctions immediately and allow you to stop if a jam occurs. Bench-mounted for rigidity and stability. The CPS is a bench-mounted priming tool. This ensures a controlled and static orientation of the case being primed, so that if a faulty primer detonates, the blast will be directed straight upwards through the case mouth rather than in a random direction. Being mounted to a bench also allows for a consistent technique and operation of the priming tool. Rotational drive system. Nearly all other priming tools on the market utilize a pivot drive system to provide leverage. The drawback with those systems is that the amount of force required to achieve the desired leverage changes through the tools range of motion. Unlike pivot-driven designs, the CPS provides an accurate and constant feel through the entire range of motion. This, combined with the extreme strength and rigidity of the CPS ensures that you will "feel" each primer as it is being seated. This is important so that worn out brass can be identified and culled when you feel a loose primer pocket. Primes nearly any case, including 338Cheytac, 375Cheytac, and 408Cheytac. Rotationally-driven ultra-rigid design for enhanced user feedback. Fully ambidextrous, for ease of use. Uses inexpensive Lee/Sinclair shell holders. Incredibly fast without sacrificing precision. Primer seating depth adjustable in .001" increments. Universal primer tube compatibility for ease of loading. Manually operated shuttle feeding system. Ergonomic anti-fatigue handle to ensure stress-free and efficient operation. 100% machined All-billet design. No cheap cast or plastic parts to break. Shell holders for your cartridges. 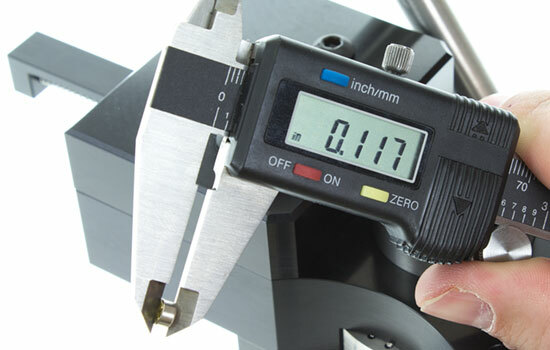 The CPS is compatible with Lee Auto-Prime type shell holders. This is also the same style used by Sinclair and other priming tools. 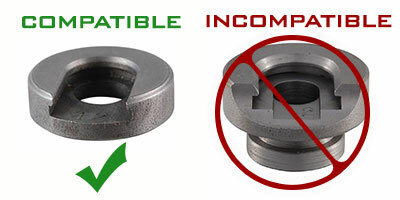 The CPS is not compatible with RCBS and Hornady type shell holders which are used in their presses. 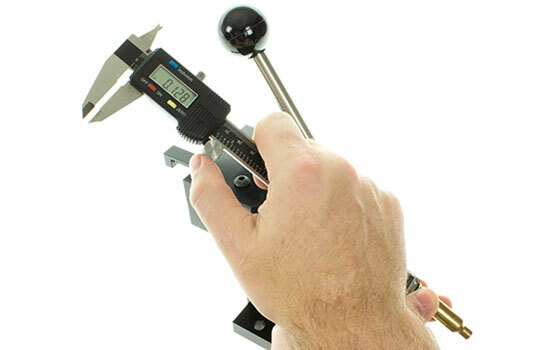 Use the stem of your caliper to measure your primer pocket depth and record this measurement. In the image above you can see the primer pocket measures .128" deep. Measure the thickness of your primer. Measure the primer from the bottom of the cup to the top of the anvil as is seen in this image. Then measure from the bottom of the cup to the top of the cup as seen in the image in the next step. Subtracting the second number from the first will tell you how far the anvil is protruding from the top of the cup. So in this example we can see that the primer anvil was protruding .008" or 8 thousandths of an inch. From here you can decide just how you want to seat your primers. If you want the anvil to just touch the bottom of the primer pocket, you would subtract your primer thickness of .125" from the primer pocket depth of .128", which would seat the bottom of the primer cup .003" beneath the base of the case. If you wanted to seat all the way to the primer cup, completely compressing the anvil into the primer, then you would subtract .117" from .128" giving you a measurement to the bottom of the primer cup of .011" beneath flush. Once you've decided on what depth you want to seat the primer, you can use the caliper stem to check your work. On the example above, we have compressed the primer anvil slightly, resulting in the primer cup being 8 thousandths below flush. Don't struggle with inferior equipment at the loading bench.